Let’s take a quick look at the Serena Williams Biography and break down her game in detail. Serena arguably has dominated women’s tennis since the late 1990’s! Just like her sister Venus, Serena did not play much junior tennis even though her level of play was already very strong. Their father wanted them to take it slow, focus on school-work and live a rather normal life. Once she started on the professional circuit though, she was very successful early on. In 1999, only her second full-time year on the pro circuit, she finished No. 4 in the world already! Since then up until today, Serena Williams has been one of the best women’s players on the tour. Overall she has won 13 Grand Slam singles titles and 12 Grand Slam doubles titles! Her 13 singles titles rank her fourth in the Open era, behind Steffi Graf, Chris Evert, and Martina Navratilova. In 2002-2003, Serena Williams also became one of only five women to ever hold all four Grand Slam singles titles simultaneously! Again we will analyze her game in the context of the four areas of Tennis. But first let’s have a quick look at her amazing forehand in slow motion! Serena’s Forehand: The best shot in women’s tennis ? Great extension and a high finish: a great model to copy for recreational players! Serena has a phenomenal forehand! It is certainly one of the most dangerous shots in women’s tennis. She usually hits the ball rather flat and can really penetrate the court. Her strength is that she really hits through the ball and therefore gets really good depth on her shots. The main reason for this is great extension on the swing. Her racket goes way out to the target and is usually accompanied by a very high finish. The swing pattern on her forehand is high to low to high and inside-out. 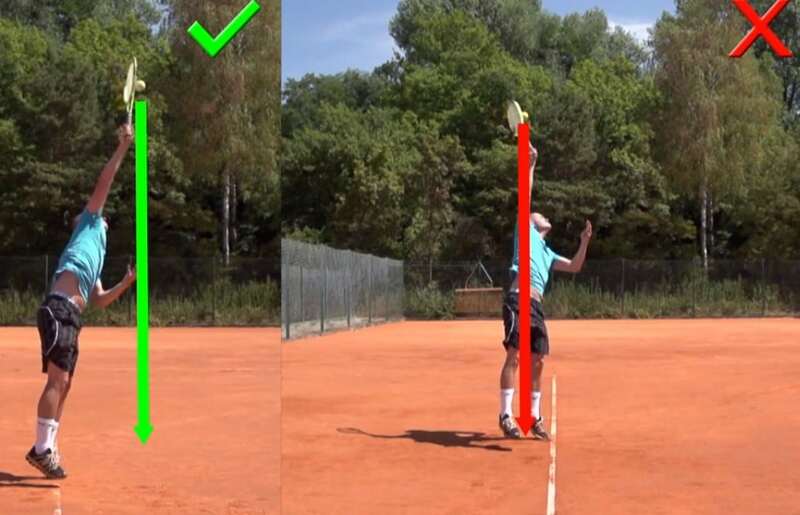 This is the key swing pattern for great tennis groundstrokes. 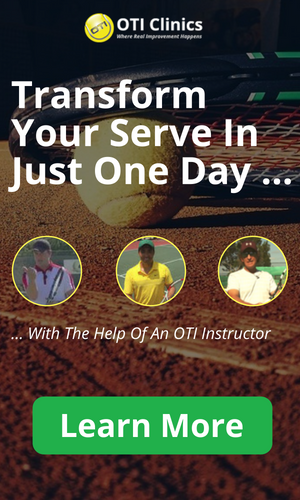 To learn more about the key swing patterns for great tennis strokes visit the Tennis Video Instruction page on this website! Serena’s backhand is very strong as well. She has solid fundamentals with a great inside-out swing pattern. Very similar to her forehand, she can penetrate the court well with great depth. This is due to great extension and a high finish position. Extension and a high finish position are two characteristics that I know her junior coach Rick Macci really focuses on. Additionally, her short compact backswing also allows her to return serves well. Serena is not known for a great slice backhand. Like most women on the pro tour, she uses it very rarely; mostly on low balls or from a very defensive position. When slicing, she usually does not coil her upper body enough. This in turn forces her to rotate her upper body too much and swing left to right at contact. Also the racket face tends to be a bit too open so her balls end up floating and having too much sidespin rather than penetrating the court more. Serena has a pretty solid net game! She has won many titles in doubles and in singles she does not hesitate to come in to the net and finish points as well. In my opinion this is a big advantage over some of her peers because she can end points quicker and with less effort. Her forehand volley is the stronger side. Again like many players she has more of a forehand grip when she volleys and does not change it towards the backhand volley. She can really stick the forehand volley well since the racket face is not too open. She still hits a pretty solid backhand volley even though her racket face is a bit too open in my opinion. Since she has relatively strong forearms though, she can manage to compensate with her wrist position and still hit through the volley enough. Serena’s serve is a huge weapon. When she is serving well, she can dominate entire matches with this shot! What I really like about her service motion is that it is very fluid. There is no stopping of the racket throughout the entire swing. Like with all great servers everything about her serve looks very effortless and easy. The motion is very slow and gradual in the beginning until the last phase before contact where she fully accelerates the racket. She also keeps a very loose wrist/forearm and has great pronation on her serve. Overall simply a great service motion! Serena’s game plan suits her physical abilities very well. Her tactics are centred around pressuring opponents early on in the point and keeping points short in general! Her biggest strength is her firepower. Beginning with the serve and return of serve she tries to take immediate control of the point. Her down the line forehand and backhand shots are very dangerous as well. Like most champions she usually dictates play with her own style and does not adjust to her opponent’s game too much. One more huge advantage she has to a lot of her opponents is that she can come in and finish points at the net! The one tactical weakness that I see in her game is the lack of defensive skills. Instead of defending with a high ball or a slice every now and then, she usually goes for a winner from defensive positions. Rating Serena Williams on the physical part is a difficult task in my opinion. On one hand, her physical abilities are a huge aspect of what sets her apart from her opponents! On the other hand, she has been criticized throughout her career for not being in shape and not working hard enough on conditioning. I believe Serena and her sister Venus are in a different league when it comes to raw athleticism compared to the rest of the women’s tour. My guess would be that they could easily outperform the rest of the top players in categories like strength, explosiveness, and speed. The reason they can hit the ball harder than other girls on their serves and groundstrokes definitely lies in athleticism. As is often the case when someone has a huge talent for something though, the hard work can be neglected at times! Several experts in Tennis have openly criticized Serena for not putting in the work off the court to maximize her potential and I believe she probably could have won a few more titles already with a little better work ethic off the court. Serena Williams has incredible fighting spirit. I think that she is mentally the toughest player on the women’s tour! Especially in Grand Slams you can see her showing incredible body language. She appears like a warrior out there willing to do whatever it takes to win the match. Serena – A True Competitor On The Court! Like every great competitor, Serena really looks like she loves the battle out there! Also Serena is known to play little mind games with her opponents. This in combination with her fighting spirit can really intimidate some of her opponents out on the women’s tour. Serena, like all the other great champions, is generally strong in all four areas of the game. I decided to put her physical abilities at No. 4 for the simple reason that I believe she is underachieving in this area. Success for Serena is all about committing to prepare well in my opinion. We already know that her game is strong enough to beat anybody in the world when she plays well! Getting in the best possible shape is key for her. Many of her opponents are extremely fit these days and get a ton of her hard-hit balls back. Another thing to work on would be to develop better defensive skills. The game keeps evolving and I think Serena needs to get better in this area as well!